Servers balance plates and pile one dish on top of another to give customers a small taste of everything at The Corner Restaurant located along King George Street in Jerusalem. Customers can choose to let the waiters decide what they will eat for lunch that day. The quick service, tasty food, and serendipitous meal are main attractions of The Corner Restaurant. Meir Micha, the owner of the critically acclaimed restaurant, is a lively character eager to have his customers try new foods and share the history of Israeli cuisine. 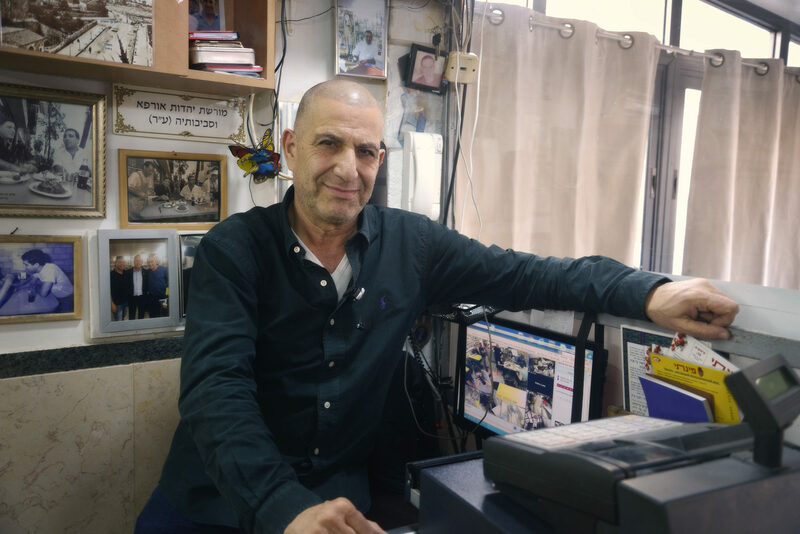 Meir Micha, owner of The Corner Restaurant. Micha referred to when the Ashkenazi and Sephardic Jews returned to Israel after they were scattered all over the globe during the Diaspora. With the establishment of the state of Israel, they brought their culture and food from Eastern Europe, Spain, Portugal, and many other countries. “Asking ‘does Israel have its own unique cuisine?’ is the billion dollar question,” Micha said. Micha said Arabs argue they brought hummus and falafel, but he claims the Ashkenazi brought these dishes when they returned to Israel. They also brought lox, chicken soup, and chopped liver. During the early 1900’s, Jews immigrating from central Europe brought schnitzel and strudels, while Russian Jews brought herring dishes. Because the country is just shy of 70 years old, other nations largely influenced Israel’s cuisine since it is too young to have its own. Despite this, Micha said Israel claims their cuisine is part of their identity. Micha said Israelis have taken Mediterranean dishes and the influences from other Middle Eastern countries and added their own touch, such as adding new kinds of fruits and vegetables they gained access to after the agricultural revolution. They also use kosher wine to cook and use more ‘Kibbutz foods,’ which consist of various types of cheeses, yogurt, salads, olives, hardboiled eggs, and bread. Adding these personal styles makes the cuisine recognizable to any Israeli.